My Easter Egg Hunt is a new book by popular author-illustrators Rosie Smith and Bruce Whatley. 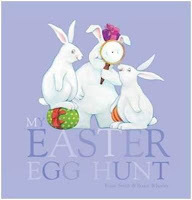 It has simple pictures, simple text, and perfectly captures the joy of hunting for Easter eggs. Three sweet bunnies play hide and seek with their friends, looking for brightly decorated eggs. The text directs ‘look down’, or ‘look under’ and young readers will follow, finding eggs in unusual places. The illustrations have no background to distract from the central focus - two or three animals and the egg they are searching for. The spare text on each page complements this. The story is told as much through the pictures as the words. Look at the last picture and see who has already eaten his chocolate egg. Soft colours and playful expressions on the animals make this a gentle read. It will be engaging for an audience from three years and up but could be read to younger children, toddlers and babies even. Bruce Whatley has illustrated many well-loved and awarded children’s books. Among them, Flood (with Jackie French) won CBCA Honour Book, CBCA Picture Book of the Year 2012, The Littlest Refugee (written with Ahn and Suzanne Do) won CBCA Honour Book, CBCA Eve Pownall Book of the year 2012 and Detective Donut and the Wild Goose Chase (with Rosie Smith) won Honour Book, CBCA Picture book of the year 1998. His collaboration with Jackie French, include the popular Diary of a Wombat, Josephine Loves to Dance, Pete the Sheep and Queen Victoria’s Underpants. With Rosie Smith he has produced picture books such as My Dad’s the Coolest, My Mum’s the Best and Hunting for Dragons.